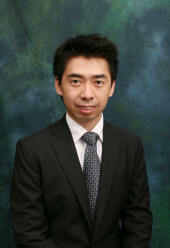 Dr. Alan Pak Tao Lau obtained the B.A.Sc. in Engineering Science (Electrical Option) and M.A.Sc. in Electrical and Computer Engineering from the University of Toronto in 2003 and 2004 respectively. He worked on source coding techniques for wireless communication systems utilizing multiuser diversity for his masters’ thesis research. He then obtained the Ph.D. degree in Electrical Engineering at Stanford University in 2008. He is the recipient of numerous government awards during his post-graduate study at Stanford University. He also worked at NEC Labs America in 2006 as a research associate in the Optical Networking Division. His current research interests include system designs and signal processing techniques for coherent fiber-optic communication systems and multi-mode fiber communication systems. He joined the Electrical Engineering Department at the Hong Kong Polytechnic University as an Assistant Professor in Fall 2008. He is a member of IEEE and OSA and serves as a reviewer for numerous journals including OSA Optics Express, IEEE Transactions on Wireless Communications and Transactions on Communications. Dr. Lau is currently looking for M.Phil., Ph.D. students as well as post-doctoral researchers to perform research in fiber-optic communications and related disciplines. Interested individuals who possess a background in photonics, fiber-optic communications, signal processing and even wireless communications are welcomed to contact Dr. Lau for further information. © 2019 Department of Electrical Engineering, The Hong Kong Polytechnic University. All Rights Reserved. This site is maintained by the Department of Electrical Engineering, information presented therein does not form part of any contract between the University and any person.